"From my perspective, at this moment, the decision to begin the normalization process at the September FOMC meeting seems less compelling to me than it was a few weeks ago.". Needless to say, "B-Dud" is a moniker implying extreme disrespect, and Bill Dudley deserves every bit of it. He is a crony capitalist fool and one of the Fed ring-leaders prosecuting a relentless, savage war on savers. Its only purpose is to keep carry trade speculators gorged with free funding in the money markets and to bloat the profits of Wall Street strip-mining operations, like that of his former employer, Goldman Sachs. The fact is, any one who doesn't imbibe in the Keynesian Kool-Aid dispensed by the central banking cartel can see in an instant that 80 months of ZIRP has done exactly nothing for the main street economy. Notwithtanding the Fed's gussied-up theories about monetary "accommodation" and closing the "output gap" the litmus test is real simple. To wit, artificial suppression of free market interest rates by the central bank is designed to cause households to borrow more money than they otherwise would in order to spend more than they earn, pure and simple. Its nothing more than a modernized version of the original, crude Keynesian pump-priming theory-----except it dispenses with the inconvenience of getting politicians to approve spending increases and tax cuts in favor of the writ of a small posse of unelected monetary mandarins who run the FOMC and peg money market interest rates at will. But the whole enterprise is a crock. The consumer spending pump can't be primed anymore because households reached a condition of "peak debt" at the time of the financial crisis. Any fool can see that obvious fact in the graph below. On the eve of the financial crisis in Q1 2008, total household debt outstanding---including mortgages, credit cards, auto loans, student loans and the rest-------- was $13.957 trillion. That compare to $13.568 trillion outstanding at the end of Q1 2015. That's right. After 80 months of ZIRP and an unprecedented incentive to borrow and spend, households have actually liquidated nearly $400 billion or 3% of their pre-crisis debt. Yes, there has been a change in the mix-----with mortgages and credit card balances down and auto and student loan balances significantly higher. But debt is fungible-----so the truth about the aggregate of all household debt is stunning. Namely, not a single dime of the Fed's $3.5 trillion QE bond buying spree left the canyons of Wall Street. Stated differently, the entirety of private debt growth since the financial crisis and the inception of "extraordinary" monetary measures in the fall of 2008 has been in the business sector; and on a net basis the modest growth of business debt during the last 7 years has been entirely recycled via stock buybacks, M&A deals and LBOs back into the speculative pools of Wall Street. So here in summary detail is what B-Dud and the small claque of Wall Street shills surrounding the Fed are actually hiding. First, it is blindingly obvious from the above chart that the household credit channel of Keynesian monetary stimulus is over and done. During the 20 years after Greenspan took the helm at the Fed, household debt rose like a rocket. From a level of $2.7 trillion in Q3 1987 it exploded to just shy of $14 trillion by Q1 2008. That represented an 8.5% rate of growth for two decades running, thereby dramatically outpacing the 5.5% rate of nominal GDP growth during the same period. Accordingly, household debt was ratcheted up on a one-time basis from from 55% of GDP to 95% by the eve of the crisis. So, yes, Greenspan's activation of the Fed's printing press during that period did goose the GDP by mortgaging household balance sheets. But that was a one-time parlor trick that is over and done, and will now tax household incomes for the indefinite future. In fact, the destruction of the household credit channel of monetary transmission is even more drastic than is evident in the chart above. That's because households do not pay interest and principal on their massive debt burdens out of "GDP" or even so-called DPI (disposable personal income). Nearly one-quarter of the latter, for example, consists of transfer payments to old people and poor people-----most of whom can't borrow at all or carry only minimal debt. Instead, most of the current $13.6 trillion of household debt is owed by middle class wage and salary earners, and it is their pool of earned income that services most of the household debt. 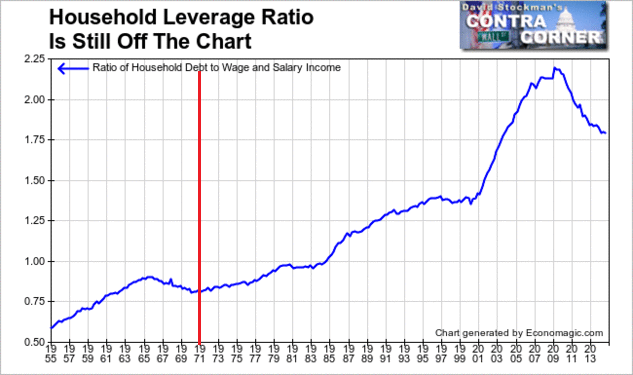 Accordingly, the household leverage chart below removes any scintilla of doubt about the fact that the Fed is pushing on one huge limp string. Relative to wage and salary income, the exhaustion of the Greenspan-Bernanke parlor trick is plain as day. Debt soared from 80% of wage and salary incomes in the 1970s, where it had traditionally been associated with healthy household finance, to 220% of wage and salary incomes by the eve of the financial crisis. But since then it has rolled over and has therefore been a depressant to growth, not a stimulant. Secondly, the modest growth of business debt did not fuel added output, either. Instead of spending for plant and equipment, thereby spurring measured GDP growth today and economic productivity and efficiency over the longer run, it went into financial engineering. So doing, it caused the massive inflation of existing financial assets in the secondary markets and thereby delivered untold windfalls to the 1% who speculate there. 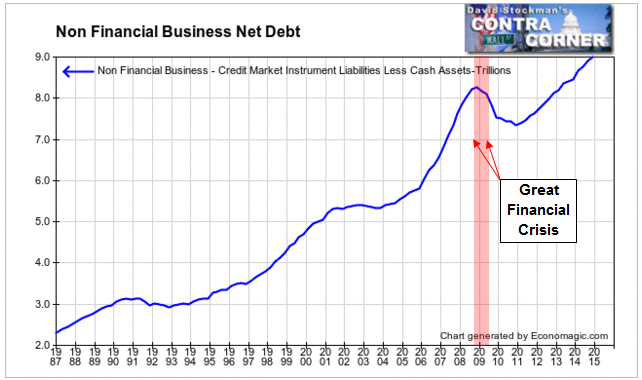 Thus, at the end of Q1 2008 nonfinancial business debt stood at $10.4 trillion and since then has grown to $12.2 trillion. But about $500 billion of that went into increased balance sheet cash, leaving a net debt gain of $1.3 trillion. While this gain is modest compared to the 4X increase in net business debt between 1987 and 2008, the more important point is that the business channel of monetary policy transmission is broken, too. The Fed's drastic falsification of financial asset prices has turned the C-suites of corporate American into gambling parlors. On the margin, all of the gains in business debt since 2008 has been flushed right back into Wall Street in the form of stock buybacks and debt-financed takeovers. The evidence that zero interest rates have not promoted business borrowing for productive investment is also plain to see. During the most recent year (2014), US business spent $431 billion on plant, equipment and software after depreciation. That was 7% less than net business investment in 2007. And these are nominal dollars! 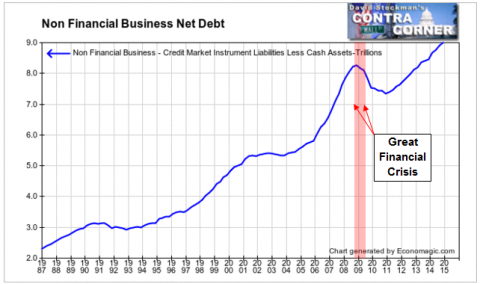 So all other things being equal, net business debt could have fallen over the past 7 years. The actual gain in net debt outstanding shown above self-evidently went into financial engineering----that is, back into the Wall Street casino. Here's the thing. You don't need fancy econometric regression analysis or DSGE models to see that ZIRP is an macroeconomic dud. Simple empirical data trends show that it hasn't goosed household borrowing and consumption spending, nor has it stimulated business investment. And that's what makes Dudley, Yellen and the rest of the posse so detestable. They are deploying formulaic Keynesian incantations about an allegedly incomplete and fragile recovery to continue to pleasure Wall Street speculators with several more months of free carry trade funding, and by every indication several more years of money market rates that are tantamount to zero. For crying out loud, a "fragile" macroeconmy has nothing to do with it. Zero interest rates have not goosed main street activity for 80 months now-----so why would a rounding error 25 bps or even 50 bps rate in the money markets have any impact whatsoever? It wouldn't. This is all about the Fed's deathly fear that Wall Street will stage a hissy fit if it is not guaranteed free or quasi-free gambling stakes for the indefinite future. That's why the monetary politburo dispatched B-Dud out to calm the robo-machines and hedge fund gamblers on Wednesday. Yet what about the tens of millions of main street savers and retirees who are being financially ruined by the writ of B-Dud and the FOMC? In a word, they are being sacrificed to the hair-brained theory that the central bank can create lasting gains in output and societal wealth by rigging the price of debt and inflating the value of risk assets by subsidizing ceaseless gambling in the casino. And do not think "hair-brained" is an excessive term. There is an in-grown circle of a few hundred monetary apparatchiks in the world that now runs the whole central banking horror show. In addition to the governing boards of the Fed, ECB, BOJ, BOE, PBOC and their senior staffs, there are perhaps a few dozen economists and financial journalists that complete the circle of group-think. Among these are the blatantly Keynesian editorial writers and commentators of the Financial Times. In a recent editorial that is so outrageously daffy that it could have been posted in The Onion, the FT let the cat out of the bag. What these unspeakably dangerous fools argued was that cash should be abolished so that the central banks could get on with their job of stimulating "depressed" economies by setting interest at negative nominal rates. In other words, it is apparently not enough that someone who saved $150,000 over a lifetime of work and foregone consumption should earn just $1 per day of interest on liquid savings deposits or treasury bills. No, the central bankers' posse now wants to actually expropriate these savings by extracting a monthly levy, and by throwing anyone in jail who attempts to hide their wealth outside the controlled banking system by keeping it in private script or unconfiscated greenbacks. ....... But even as individuals have taken recent crises as reasons to stock up on banknotes, authorities would do well to consider the arguments for phasing out their use as another “barbarous relic”, the moniker Keynes gave to gold. With a recovery under way in most rich countries this may seem academic. The talk is now of when to raise rates. But the fear of the lower band is still causing damage. The dominant argument for beginning the tightening cycle is to have enough “ammunition” for a new stimulus when the next downturn comes. Removing the lower band would leave central banks well equipped to deal with a slowdown even from near-zero starting points. There you have it. The private economy and its millions of savers exist for the convenience of the apparatchiks who run the central bank. And this view is not limited to the editorial scribblers at the FT. Their reasoning was identical to that offered by Kenneth Rogoff, the former chief economist of the International Monetary Fund, who recently advocated abolishing high-denomination banknotes such as the €100 and €500 notes. So B-Dud was sent out to save the day for Wall Street, but it had nothing to do with the "in-coming data". He was acting for a small posse of destructive monetary rulers who have hostaged themselves to the furies of the casino. In their palpable fear and unrelieved arrogance, would they now throw millions of already ruined retirees and savers completely under the bus?